Autumn - the word reminds me of wood smoke on a crisp morning, multi-colored leaves fluttering through the air, and the taste of pumpkin pie. At least, those are the sensations I experience when I see or hear the word. As usual, an image search revealed a lot more than I imagined. This 1874 print of autumn leaves with the phrase, Walk in Love, came in under the heading of Prang's Floral Mottoes. Included information also called it an emblem picture. I would have loved to find one in cross-stitch or crewel work, and at 28 x 43.3 cm would have been perfect for seasonal wall decor. [Prang's floral mottoes, no. 18?]. Walk in love. L. Prang & Co. Boston, . Source: Library of Congress Prints and Photographs Division Washington, D.C. 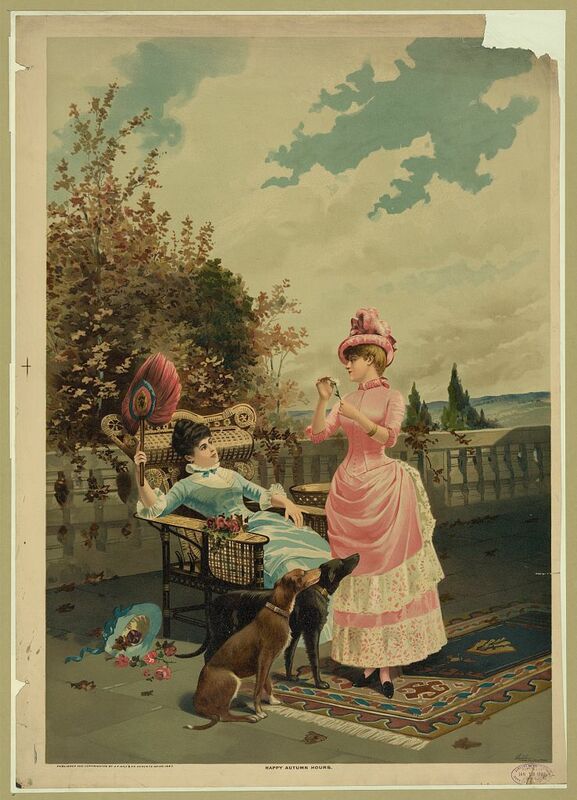 In 1887, this print of two women enjoying themselves on a plaza suggests the day to be quite warm according to their wardrobe, however, the scattering of colored leaves by their feet prove the seasonal change to autumn has begun. Happy Autumn Hours, c1887 Jan. 13. 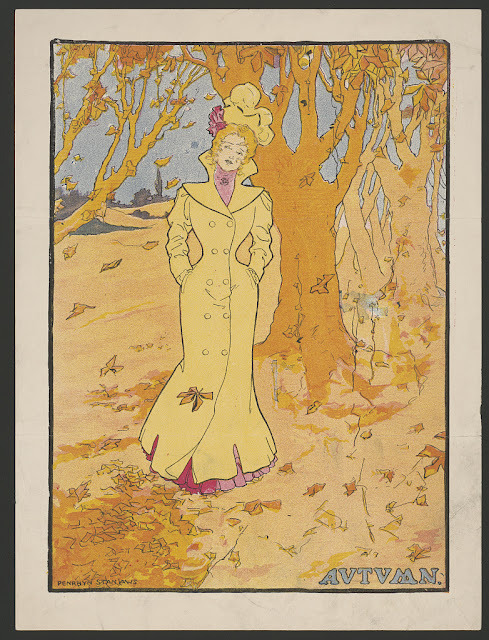 Source: Library of Congress Prints and Photographs Division Washington, D.C.
Another fashion image showing autumn is this delightful American poster by Penrhyn Stanlaws, artist, showing a woman "...wearing a long yellow coat and matching hat, walking pass (sp) trees as the wind blows leaves all around her." The color combinations in this poster, as well as the artistic use of the archaic spelling of the word, AVTVMN, draw my gaze when placed among other autumn images. Autumn Hours, Signed: Penrhyn Stanlaws, 1907. Source: Library of Congress Prints and Photographs Division Washington, D.C. 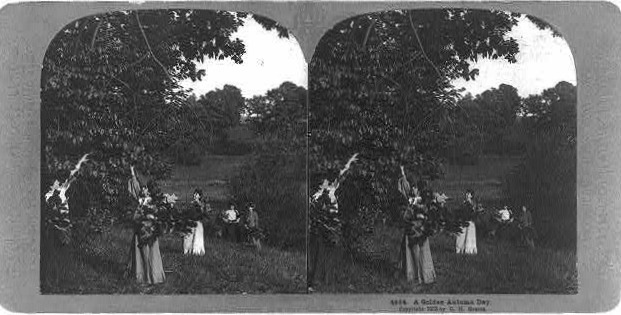 In the early 20th century, stereographs were commonly found displaying social life. This one from 1903 shows five women gathering leaves - still a favorite fall activity - and comes under the title, A Golden Autumn Day. A Golden Autumn Day, c1903. Source: Library of Congress Prints and Photographs Division Washington, D.C. Although this 1906 Vancouver, British Columbia, street scene doesn't look like autumn, the caption on the back reads, "Granville Street, near Pender. Looking North. A foggy day in the autumn. 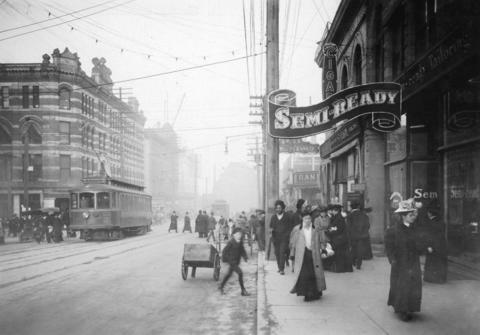 One auto, tram cars on the left hand side, the hand cart, Rand Bros. office, Old Style sign of 'Semi-Ready.' The corner before the Rogers building was built." Do you know what caught my eye in this photograph other than the fashion and the tram? The Semi-Ready sign. My imagination ran away wondering what was sold as semi-ready in this era (ie clothing, baking, food, shoes?) until I spotted the title. 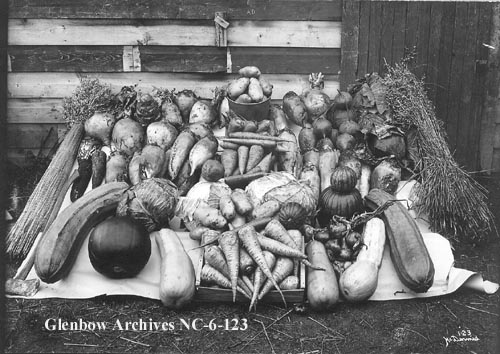 Of course, I can't show autumn images without some type of vegetable display and here we have a 1912 photograph showing harvest treasures from Edmonton, Alberta. And because I like showing fashion via real photographs, this 1912 image from Milton, Ontario is from Bessie Murray's photograph album showing the closing exercises of the W.L.C. in 1912. 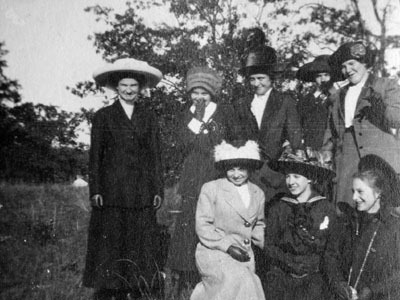 No scattering of leaves, but entitled, Seven Women Dressed in Autumn Clothing. 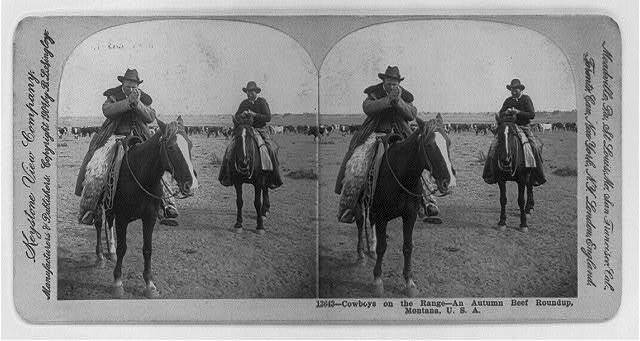 Of course, what would autumn be without a cattle roundup...This 1904 Montana stereograph shows, "2 cowboys on horseback, one rolling cigarette; the other lighting cigarette; herd of cattle in background." I wonder if this was used in a cigarette ad? 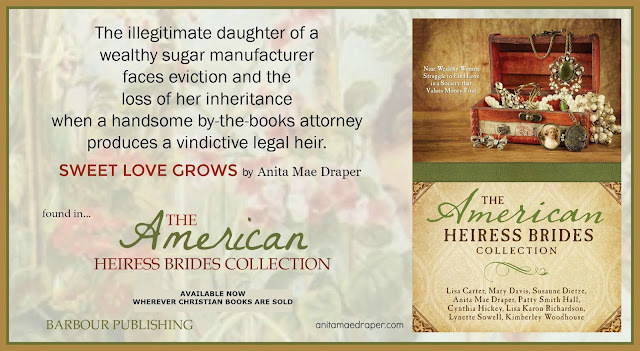 I seem to recall several such ads with cowboys and cattle while growing up. Cowboys on the range - an autumn beef roundup, Montana, c1904. Source: Library of Congress Prints and Photographs Division Washington, D.C. Since many social events of autumn ended in a hay ride, I found this image entitled, Vacation Days in Autumn on the Farm, which was published in both photographic prints and stereographs from 1900-1910. 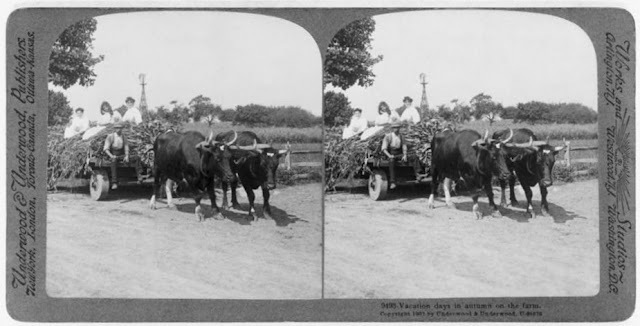 The summary information reads, "Women enjoy hayride on cart pulled by two cows." Note that these cows are female oxen, not milking or beef cows as commonly known. Vacation days in autumn on the farm. 1900-1910. Source: Library of Congress Prints and Photographs Division Washington, D.C.
Do you remember the smells of burning leaves? 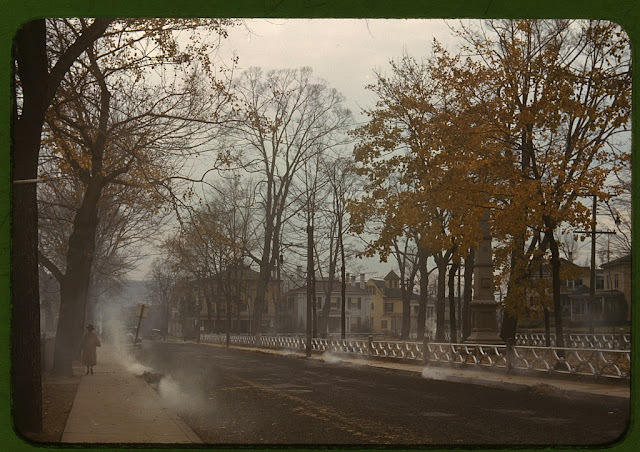 Here's a 1940 color slide from Connecticut showing something not often seen these days...leaf burning in the streets. Burning the autumn leaves in Norwich, Connecticut, 1940 Nov. Source: Library of Congress Prints and Photographs Division Washington, D.C. The scenes of autumn are varied and ever-changing, depending on where you live, but full of color and the expectation of new things to come - like Christmas. What comes to mind when you think of Autumn? To me, fall means looking skyward for migrating cranes. These beautiful large birds are slowly making a return from near extinction and some pass over our house ever spring and fall where they're mixed in with sandhill cranes. 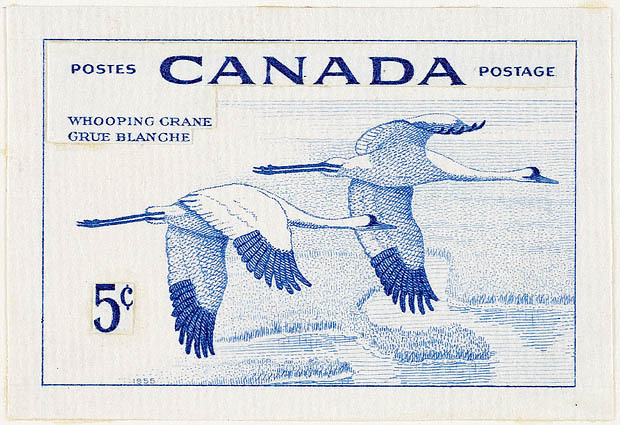 Postage stamps, like this Canada 5 cent from 1955, followed by a 3 cent U.S. stamp in 1957, brought some awareness to their situation, as do conservation efforts on both sides of the border. Anita, this time of year is my favorite. The color temps and the beautiful colors invigorate me. Thank you for sharing your most interesting post. I love the pictures! We've finally had our peak color two weeks late. Then last night's storm blew them away. What a wonderful selections of photos, Anita! 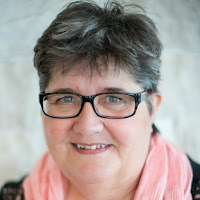 Thanks, Deb. Ours was early and prolonged. I planned to visit Ontario at end of September to see the splendor, but family matters kept me home. I'm not complaining, however, as I'm quite satisfied with the beauty of home. Hope you got to enjoy yours while it lasted. Thanks for the old photos! I agree that that "Walk In Love" panel would be stunning! The few things I don't like about autumn are the bare tree branches, early nightfall and harbinger of snow to come. 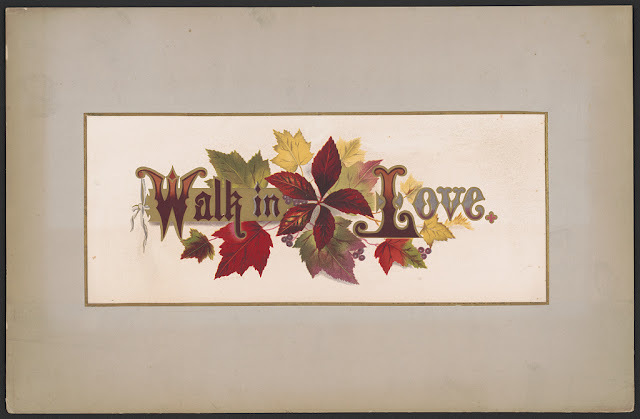 I love the message and simplicity for Walk in Love, of Prang's Floral Mottoe. We are finally seeing the beautiful fall colors. Initially the leaves were just turning brown with the dryness, but plenty of rain recently. I enjoyed seeing so many lovely tress the past couple of days driving. God's beautiful world He created for us. Amen, Marilyn. Thanks for sharing that. So glad you had a chance to experience the colors. I love driving in the fall when I can capture the splendor to carry me through the long months until spring.